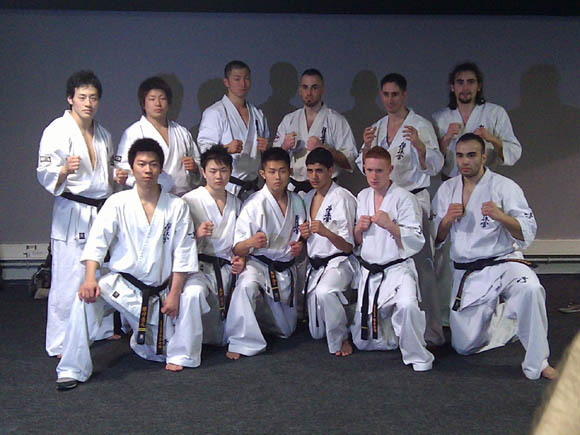 On March 24, the IKO Kyokushinkaikan held a special Japan vs. France competitive match challenge at the annual pan-European martial arts exhibition, "Les Festival des Arts Martiaux" sponsored by Karate Bushido Magazine in Paris, France. The six Kyokushin matches held at the Bercy Arena were the Main Event of the evening before over 10,000 excited spectators and televised live during primetime on French National TV for millions across the country. The results were 3-3 tie, and Kancho Matsui and French Branch Chief Shihan Jacques Legree presented trophies to each the French Team and Japanese Team respectively.